We had no idea what kind of food to expect in Winnipeg, but when we heard about a popup restaurant last winter on the frozen Assiniboine and Red Rivers, we knew we were in for good things. I mean, a RESTAURANT on a FROZEN RIVER with TREE STUMPS FOR CHAIRS and PARKAS and CANVAS WALLS and FLIPPIN’ ELK TARTARE? Come on. That's solid stuff. The pop-up was called ‘Raw: Almond,’ and conceived of by Deer + Almond chef Mandel Hitzer, Segovia’s Adam Donnelly, and Raw architecture gallery’s Joe Kalturnyk. Throughout the restaurant’s short life, various chefs took the helm to cook for groups of sixteen at a time, including brunch on Sundays. The wildly successful project seemed to sum the city up well: even in -35 temperatures, the people of Winnipeg couldn't be prevented from collaborating, creating, and having a darn good time. 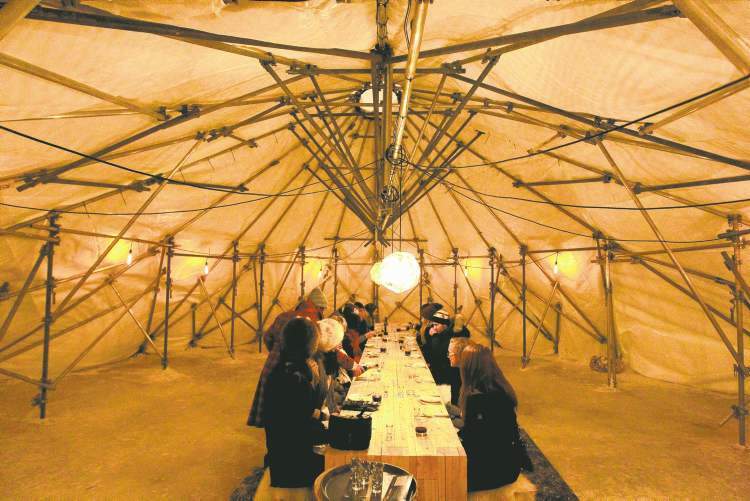 It makes dining on anything but a frozen river seem very drab indeed. 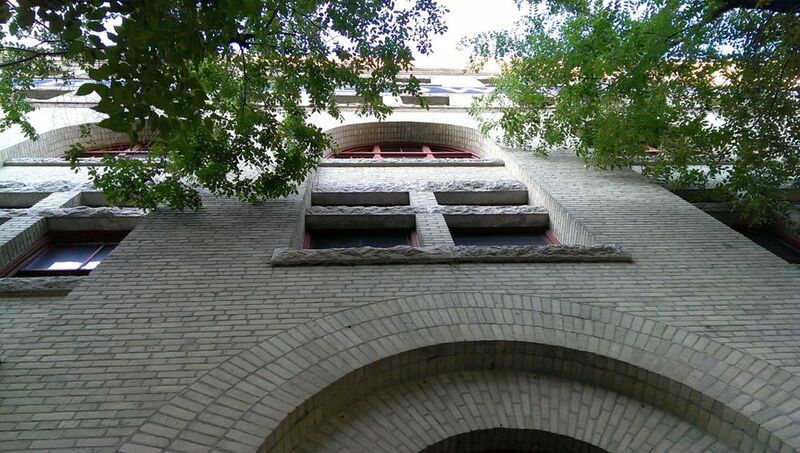 While we showed up in summer when the Assiniboine still flows freely, we had plenty of opportunities to explore Winnipeg’s dynamic and ever-changing food scene. We began with an eating tour of the historic Exchange District, which could be compared to Vancouver’s Gastown. The tour included stops at six Exchange District eateries, as well as short history lessons on the area and buildings in which we dined. Another day, feeling the need for something to combat all the gloriously fat-laden rillette we’d eaten the night before, we went to Boon, an all-vegan burger bar with a focus on sustainable and fair-trade ingredients. Honestly, this is the kind of shop I’d expect to see on the west coast, not in the middle of Manitoba, and we were so happy to have found it! 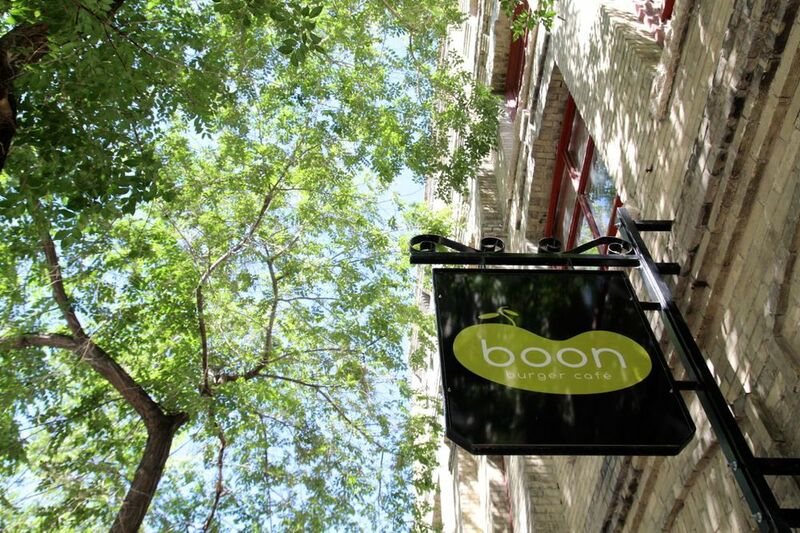 Boon was super tasty, healthy, filling, and very, very popular. 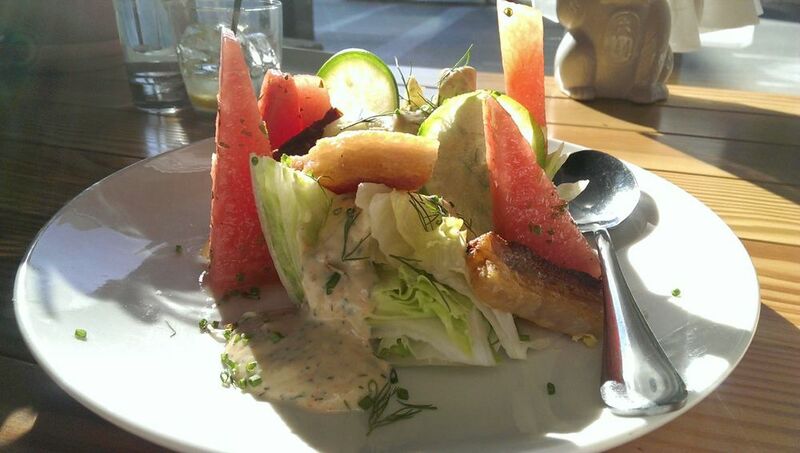 and the iceberg/watermelon/crispy pork belly salad at Deer + Almond which, along with several great cocktails, couldn’t have been more refreshing on a hot day. We may not have had a chance to dine on Winnipeg's frozen waters, but as you can see, the food we had on land was extraordinarily good.